Brandon? No. Brendan? Not quite. 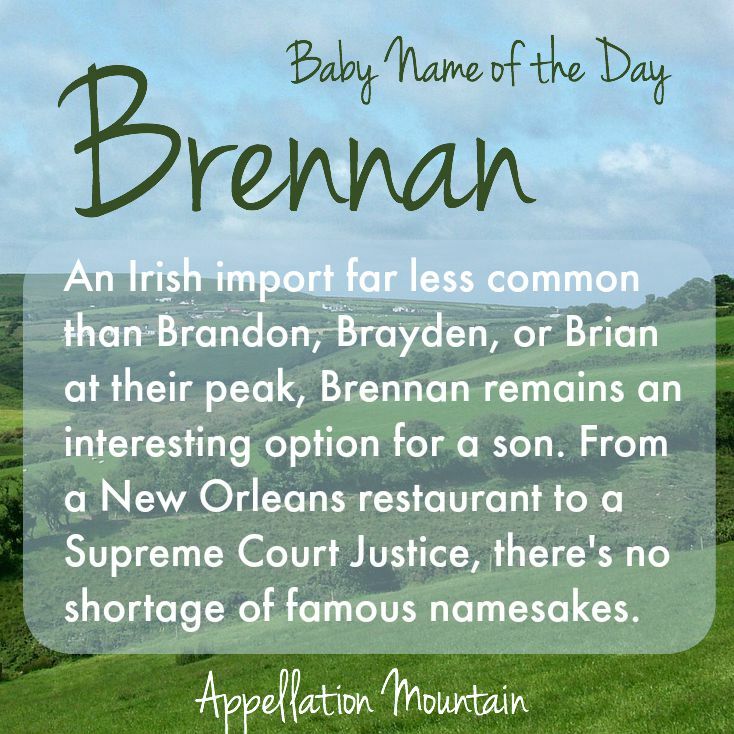 Today’s Baby Name of the Day is the just slightly different Brennan. Thanks to Kenneth for the suggestion. Brendan caught on first, an early Irish import that started to rise in the 1940s. But Brandon was the breakout star, entering the US Top 1000 in the 1950s, cracking the Top 100 in the 1970s, and then, with a boost from everybody’s favorite nice guy on Beverly Hills, 90210, spending the 1990s in the Top Ten. Brennan is their quiet cousin, a name that has followed the others up the popularity charts, peaking at #242 in 2009. The name has at least two possible origins. 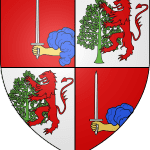 It could come from a given name derived from the Irish word for tear drop, in which case the name means something like sorrow. Or it might be related to the given name Branan, meaning raven. Brannan has seem some sparing use as a given name, too. 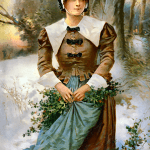 Most of the notables have worn this name as a surname. It’s a wide and varied group. New Orleans’ world-famous French Quarter is home to Brennan’s. Owen Brennan opened the restaurant in 1946. Though the family no longer owns it, the restaurant is still in operation. It’s famous for many things, including the creation of Bananas Foster, back in 1951. Television series Bones features the whip-smart Temperance Brennan. Created by writer Kathy Reichs, Temperance has been the star of television’s Bones for an impressive eleven seasons. She’s a forensic anthropologist teamed with an FBI agent to solve crimes through cutting-edge science. It’s the last name of Grammy Award-winning Irish singer Enya – though she never uses it. While we’re in Ireland, some of you might immediately think of the Bishop from beloved comedy series Father Ted. While Ted may have his faults, he’s quite likable. Bishop Brennan is not so nice. William Brennan, Jr. was Supreme Court Justice from 1956 through 1990, which makes him the seventh-longest serving justice, and one of the most influential of the twentieth century. The question is this: is Brennan a fresher alternative to traditional Irish imports like Brandon and Brendan? Or do all of the names in this category feel a little tired? Brennan was given to 802 boys in 2014. That’s down from a peak of 1,462 boys in 2009. Brendan was given to was given to 911 boys in 2014, but peaked way back in 1999 with almost 4,000 newborns given the name that year. In the mid 1980s and early 1990s, there were several years with over 29,000 baby Brandons welcomed to the US. 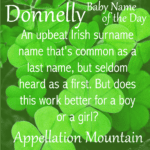 That’s why I think this name remains just a little bit different, and far more wearable than many an Irish name for boys. 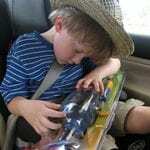 Brian is edging into grandpa territory, and Brayden – pick your spelling – is fading with the rest of the -aydens. 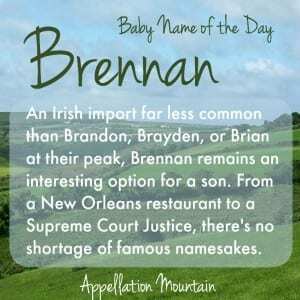 Brennan feels relatively underused, distinctively Irish, and just a little bit different. It could be a great stands-out/fits-in name for a son. What do you think of Brennan? 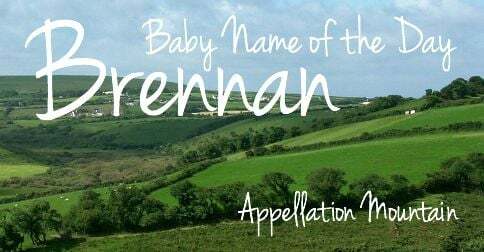 Does it feel fresh and interesting, or too much like those other Irish names for boys? It’s our boy’s name, though we spell it with an “o” instead of an “a.” Felt more masculine. We’ve heard it, albeit rarely, for both boys and girls. I actually like it better for a girl — maybe with Bryn as a nickname. I definitely like Brennan. Because it is a surname and because of the Dr. Temperance Brennan TV character I wouldn’t be surprised if it becomes a true unisex name.